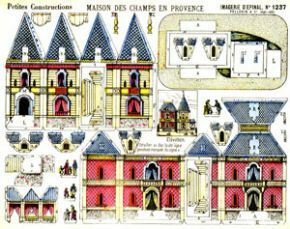 Micromodels are designed to fit onto a series of postcard-sized sheets. The concept was invented by Geoffrey Heighway in the late 1930s. Early sets featured planes, trains and ships, then in 1947 Heighway founded Micromodels Ltd and added architectural models. The range soon expanded to cover many important British buildings such as Westminster Abbey, Hampton Court and the London City gates. The series also included world architecture such as the White House. With the advent of more complicated plastic kits, sales of Micromodels decreased and in 1956 Heighway sold the company. The models enjoyed a resurgence of interest in the 1970s as old stocks of kits were sold off at reduced prices. Micromodels are now produced by Micromodels USA. This company makes facsimiles of original sets and has gained permission to complete some of Heighway’s previously unreleased designs. Imagerie d’Épinal PellerinJean-Charles Pellerin founded his printing company in 1796 in the small town of Épinal in north-eastern France. Its early output included playing cards, paper dolls and wood-block prints of fairy tales. Pellerin made its name in Napoleonic times producing prints of the Emperor and his battles. In the middle of the 1800s the arrival of M Grivel, a lithographic printer, transformed and increased the company’s output. Buildings, scenery, activities, figures and constructional toys were produced in great quantities. The company is now know as Imagerie d’Épinal and still uses its hand-operated presses to produce images. Image d’Épinal has become a common expression in the French language, describing a traditional depiction of something which shows only its good qualities. Milton Bradley and CompanyMilton Bradley (1836-1911) was a keen disciple of the educator Friedrich Froebel (1782-1852) and played a key role in the introduction of Froebel’s Kindergarten movement into the United States. Bradley founded his company in 1860 and specialised in education toys and games. His philosophy was that learning should be fun. Milton Bradley is credited with the mainstream success of the board game in the United States. The company’s most famous games include Buckaroo, Mouse Trap, Ker-Plunck, Twister and Operation. The paper models that the company produced in the 1930s and 1940s taught children about other cultures. 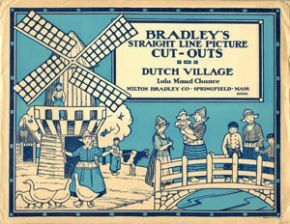 Milton Bradley & Co. continued as a successful family company, buying McLoughlin Brothers in 1920. The company was bought by Hasbro Inc. in 1984. Hasbro still uses the MB name as a recognisable brand. The Schreiber-Verlag company was founded in 1831 by Jakob Ferdinand Schreiber (1809-1968). A student of art and lithography, Schreiber started his publishing business in 1831 in Esslingen, Germany. His products were highly regarded as educational tools. As well as producing many fine examples of buildings, Schreiber became particularly well know for printing toy theatres. 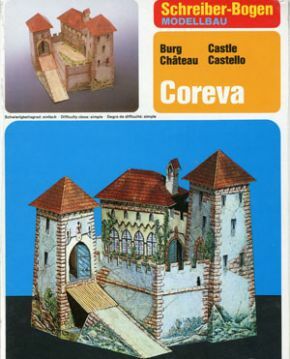 Schreiber produced many models of both famous and generic buildings. The company’s output can be seen as a reflection of German history, with many buildings and events being reproduced in paper form as they happened in reality. Today there are two different companies that descend from the original: Esslinger Verlag JF Schreiber publishes children’s books and reprints of earlier favourites, while Schreiber-Bogen makes paper models.